It is quite likely, then, that if it were not for Benjamin Franklin, the French might not have helped the Americans, and the United States would not have won its independence. The remainder of Asimovs book is dedicated to explaining how this came about. Benjamin was already an independent businessman at the age of twenty-two when he opened his print shop in Philadelphia. He convinced the State of Pennsylvania to print paper money, and was awarded the contract to design and print the money. He also knew the benefits of good advertising. When he bought the paper for his shop, he did not have it delivered like the other printers. Instead he chose to pick up the paper himself with his wheelbarrow and pushed it down the street. Thus,he proclaimed himself the hardest working printer in Philadelphia. With the alliance with Deborah, the Franklins business grew. An addition was added to the print shop and Deborah ran a stationary store that also sold teas, coffee, deserts and cheeses. One has to imagine that she could have taught Starbucks a thing or two. That was only the beginning for this Power Couple of the colonies. Around the same time that Ben started his printing business, and his family, he organized a group called Junto. The club was made up of young tradesmen starting their own businesses. Initially Junto members debated and considered local issues. However, as the club expanded, their scope of topics grew and matured to include national concerns. Franklin vigorously opposed slavery being allowed in the colonies. He also found it preposterous that woman had no education beyond learning to read. To these, and many other controversial issues, Franklin had often met resistance from other Junto members. Junto members established the first library in the colonies in 1731. Meanwhile, Ben was launching his most successful business venture. In 1732, he put together the first issue of Poor Richards Almanac, which would sell as fast as the press could print them. Every colonial home had at least two books, the Bible and an Almanac. A new issue of the almanac was printed every year and every year it sold out. As well as sales in every colony, the Almanac sold in England and the European continent. As with the kite flying experiment, the French also delighted in Bonhomme Richard and that would prove most helpful in his future dealings with France. The Poor Richards Almanac is still available for sale today. As his stature grew he was unable to elude the responsibility of public office any longer. He accepted the post of Clerk of the Assembly of Pennsylvania in 1736. The following year he was Postmaster of Philadelphia. Bens post office, characteristically, became the best Post Office in the colonies. At the same time Franklin and the Junto group were establishing the citys first Fire Department and full time Police Department, Ben was also urging Pennsylvania to start a University. Six years later it opened with Franklin as the first President. In 1748, Franklin made a life altering decision; and quite possibly, a world history altering decision. He left the world of business to dedicate the rest of his days to his life long passion of science and inventing. Franklin was a good businessman. He set up his finances so the Almanac, newspaper, and profits from a chain of printing businesses that Ben financed would provide a living. Had he stayed focused in business, he would probably have become very wealthy. In a letter to his mother in 1750, Ben wrote, I would rather have it said He lived usefully than He died rich.  And that he did. and for ten years he did. With the American Revolution twenty-five years away, these were, by far, the best years of his life. 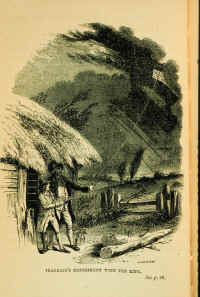 Franklin, at age forty-six, relates his famous kite experiment of 1752: Make a small cross of two light strips of cedar, the arm so long as to reach to the four corners of a large thin silk handkerchief when extended; tie the corners of the handkerchief to the extremities of the cross, so you have the body of a kite; which, being properly accommodated with a tail, loop, and string, will rise in the air, like those made of paper; but this being of silk is fitter to bear the wet and wind of a thunder-gust without tearing. To the top of the upright stick of the cross is to be fixed a very sharp-pointed wire, rising a foot or more above the wood. To the end of the twine, next to the hand, is to be tired a silk ribbon, and where the silk and twine join, a key must be fastened. This kite is to be raised when a thunder-gust appears to be coming on, and the person who holds the string must stand within a door or window, or under some cover, so that the silk ribbon may not be wet; and care must be taken that the twine does not touch the frame of the door or window. As soon as any thunder-clouds come over the kite, the pointed wire will draw the electric fire from them, and the kite, with all the twine, will be electrified, and the loose filaments of the twine will stand out every way, and be attracted by an approaching finger. And when the rain has wetted the kite and twine, so that it can conduct the electric fire freely, you will find it stream out plentifully from the key on the approach of your knuckle. At this key the phial may be charged; and from electric fire thus obtained, spirits may be kindled, and all other electric experiments be performed, which are usually done by the help of a rubbed glass or tube, and thereby the sameness of the electric matter with that of lightning completely demonstrated. Franklins kite flying experiment confirmed what he already knew. Before the identity of electricity and lightning was established with his kite, he outlined in a paper in 1749 his proposal to protect buildings with the use of lightning rods. Franklin also revolutionized the study of electricity forever when, in 1751, he was the first to use the expression positive & negative in connection with electricity. In addition to his famous electricity experiments Franklin designed a stove that worked like a radiator. He invented an odometer for use on the axle of a cart, developed bi-focal glasses and designed the combo table and chair unit that school children use. He also became interested in scientific farming and fertilizing, with great success. Franklin loved music. He designed an instrument called an Armonica. This novel instrument was so popular in Germany that even Mozart and Beethoven wrote music for it. Ben was also proficient at playing the violin, guitar, and harp; and was reportedly a good singer. Franklins inventions became well known to scientist around the world. He authored articles on a variety of topics: geology, meteorology, mathematics, physics, medicine, chemistry, navigation and astronomy. His work was often the subject of conversation in the great Universities of Europe. Honorary degrees were bestowed upon him from Harvard, Yale, William and Mary, Oxford and Edinburgh. He was elected to the Royal Society of London, as well as receiving a letter of commendation from the King of France. It is ironic that the worlds leading scientist only attended grammar school for two years and actually failed arithmetic when he did go. Ben was not always so well received. Initially the Royal Society of London laughed at his electrical experiments and mocked him, as reported in 1846 article Resistance to Great Truths in the Living Age magazine. The English also found dissatisfaction, and even contempt, for Franklin. That a printer should presume to teach the learned and aristocratic dilettanti of London, was too bad His letters were treated with the indifference they were supposed to merit. Eventually decent, honest people acknowledged the truths of Franklins experiment. Gradually respectability and renown replaced the negative reaction. After all, it was the Age of Reason. Surely, all problems could be solved if only one experimented like Galileo and reasoned from the experiments like Newton had. People were so confident that all problems could be solved by reason; the period from 1683 to1789 is known as the Age of Reason. Ben had worked zestfully for a decade as a scientist, doing experiments, inventing and writing, when he was called into duty. His country was in turmoil. He sacrificed his passion; his love of science for half of his lifetime. He was interrupted by that pesky nation building business. No man was to provide more to the American Revolution or contribute to the inception of a new nation then Benjamin Franklin. Few men, indeed, have lived, whose time, mind and resources were more wisely and conscientiously directed to the elevation of society, the enlightenment of the mass, and the improvement of human condition. He was indisputably one of the greatest benefactors of mankind. The history of Franklins electrical experiments and discoveries is one of the most attractive, beautiful, and pregnant episodes in modern science. The grand simplicity of his theory, the familiar apparatus by which it was tested, the accuracy of his foresight, and the unpretending spirit with which he received the fame incident to so great a result, form together one of those memorable instances of the conquest of mind over matter, of human intelligence over the secret facts of nature, which add the cognizance of new laws to the domain of knowledge, and brighter names to the catalogue of her immortal disciples. now that is something we mortals can relate to.